MotoGP Motegi Japan 2017 race report | IAMABIKER - Everything Motorcycle! Andrea Dovizioso powered to his fifth win of the year today at Motegi at the end of an exciting race and a terrific scrap right down to the final corner with Marc Marquez. The Ducati Team’s Italian rider has now reduced the gap in the overall standings to 11 points to the Spanish champion, with three rounds left in the 2017 MotoGP World Championship. Dovizioso, who started from row 3, moved up to third in the early laps behind Petrucci, who led until lap 12, and Marquez. Once he had passed the Pramac Racing Team rider, who eventually finished an excellent third at the flag, Andrea began to chase down Marquez up at the front. 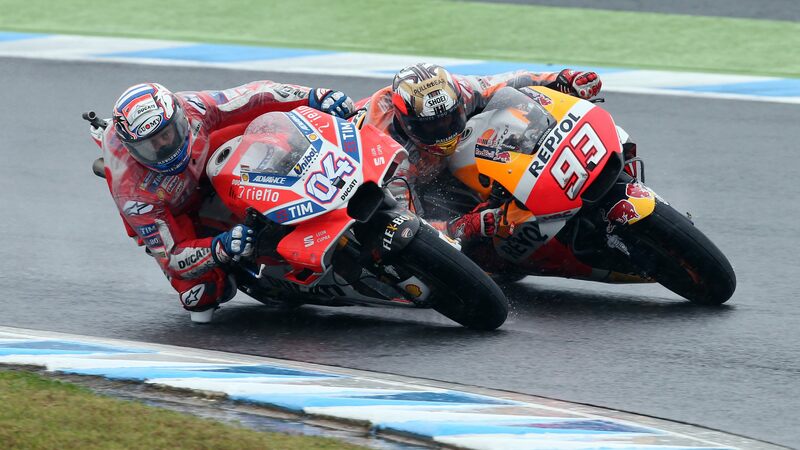 Dovizioso then caught and passed him on lap 21, but three laps later Marquez was back in the lead. The Ducati man didn’t lose touch with his title rival however, attacking four corners before the finish to hold onto his first place until the chequered flag. Marc began the final lap out front but a small mistake at turn 8 – where he almost crashed out – allowed Dovizioso to close in and then take the lead. Marc tried one final attack braking late into the last corner but he exited a little wide and Dovizioso won the drag race to the finish line by 0.249s. Marc’s second place signals his 100th career podium from 165 starts (the younger rider ever to achieve this milestone), and his 61st in the premier-class. He retains an 11-point lead in the Championship before round 16 at Phillip Island next Sunday. 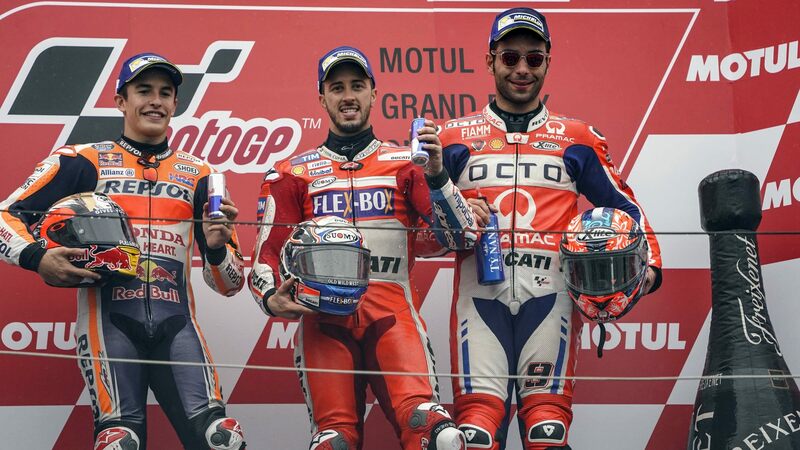 Once again on the podium with another success for Octo Pramac Racing was Danilo Petrucci – who joins the Ducati party for the awesome victory of Andrea Dovizioso. Petrux was the protagonist of a fantastic race, who dominated for 12 laps and then ended up with the joy of the 4th podium in 2017′ stunning MotoGP season. “It was an extraordinary race. After Mugello this is the podium that makes me happier. I tried to push from the first laps and when I was in front with a good gap I thought I could get to the end and win my first victory. Dovi and Marc, however, have been faster. It was nice to be behind them to see that battle. I feel very close to being there and I will try in the next three races. I would like to thank the team for their great work. This is a great moment for us”. For latest news in your mail box click HERE to subscribe to our daily newsletter!